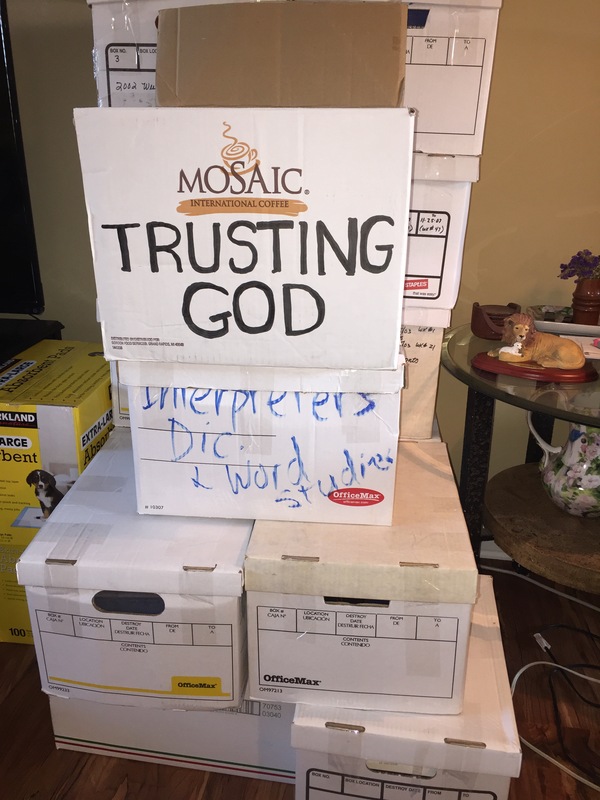 While sorting and packing my books yesterday, I found this old box with the words “Trusting God.” At first, I didn’t remember when and why I had written those words on that box. But before I went to bed, I remembered. A couple of years ago, I preached a series on worrying. I ended the series with an appeal for our people to write out their worries and come forward to throw them inside what I called “the worry box.” By doing that, they were symbolically surrendering their worries to God. So, today, it’s my turn to use “the worry box” in light of recent drastic changes in our lives. And my list is extensive at this point in my life. Will any of the conversations I’m having turn into a job opportunity for me? Where will we finding housing now that our income is dropping by 50%? Is it time for a complete change of vocation for me? What should we pack, give away, sell, toss, etc., now that we will have to downsize significantly? Where would the ideal temporary place of residence be until I find a permanent job? Since I’m planning to go school in the fall, would it be better for us to stay in the area for a while? How’s this move going to impact my son? How about his future plans for education, marriage, etc.? Will we be able to see clearly through the mist and pain where God is leading us? These are some of the unanswered questions, why not say “worries,” that I am dealing with right now. So, I’m symbolically throwing them into “the worry box” today and trusting God to take care of them. That’s a practical way to cast my anxieties on Him. The Bible says He cares for me. May I never doubt that. Hi Pastor. ….Bill said to tell you that he worries enough for the both of you put together….hehe …..so you should take a break. Actually, I remember that message and we did put our worries in the box. I pictured Jesus tearing up the worries. Praying for peace and direction for you and Naza and Josh too. We can’t stop missing you. Keep blogging. …..it’s needed. Thanks for commenting. I’m taking Bill’s advice. Glad your adventure West is going swell. Thanks for the prayers. Always welcome!